The Baumr-AG 62cc Pro-Series is a must have for any tradesman, commercial gardener or handyman. This class-leading commercial grade saw is designed and engineered specifically for low fatigue and great maneuverability. 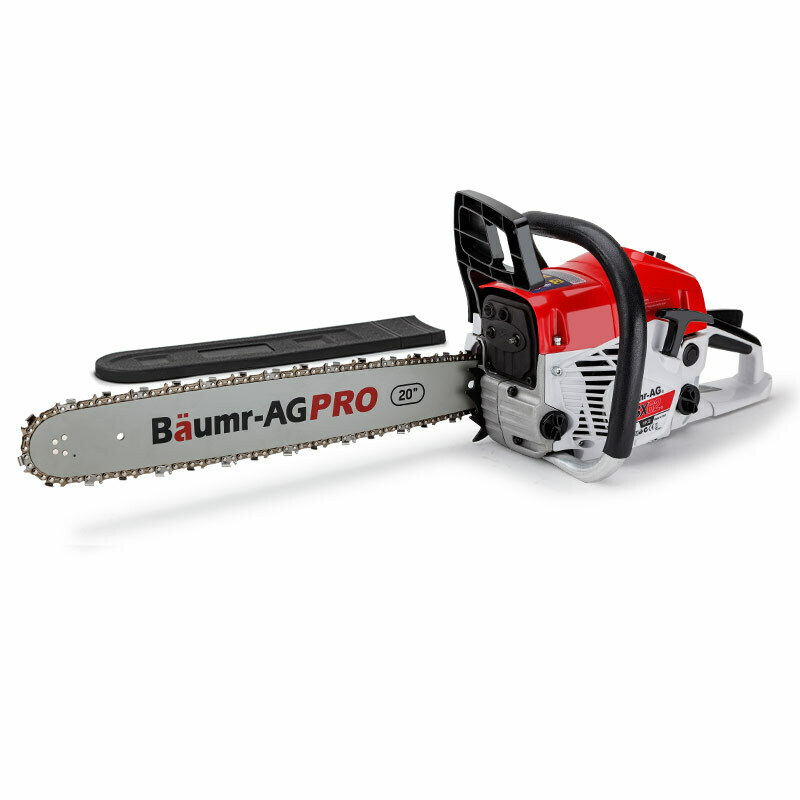 Make no mistake, Baumr-AG are the online industry leaders with unparalleled quality comparable to that of saws retailing for more than $1500 - a bold statement backed up by an extensive One Year Warranty! This premium range features Baumr-AG's patented air injection carburetor and intake system, meaning you get more grunt per CC! On-the-fly adjustments take no time at all with the on-board tool storage. And you can always keep an eye on your fuel level with the viewing window. Along with Baumr-AG's extensive product range, the SX62 features a comfortable elastomer grab bar, 360 degree cutting capability, superior oil feed, Premium Saw Chain and lightning fast Safety Brake for total peace of mind. The SX62 is perfect for any application, whether it be preparing firewood, lopping medium to large trees, clearing those overhanging branches, removing bushfire hazards, or as a great companion on your next 4WD adventure or camping trip. Purchase AUSTRALIA's HOTTEST SELLING CHAINSAW TODAY and save hundreds off this top-of-line model. Plus, for a limited time, the SX62 includes a BONUS SAFETY PACK! Ear Muffs, Gloves, Mini Toolkit and Fuel Mixer! GET SAWING TODAY! For Warranty Information please direct to your selected online retailer. We only honour Warranty through our authorized Baumr-AG online retailers. For Warranty Information please direct to your selected online retailer. We only honour Warranty through our authorized Baum-AG online retailers.